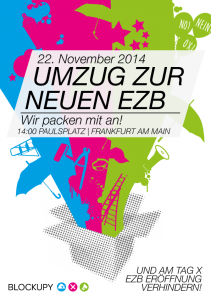 March to the new ecb – we help with the move! or sexist separation, pauperization, the privatization of public funds or goods nor the waging of wars for securing resources – this rubbish will be returned by us. We will help with the move and carry our critique to its front doors, run to its gates and to the fence, behind which they entrench themselves. 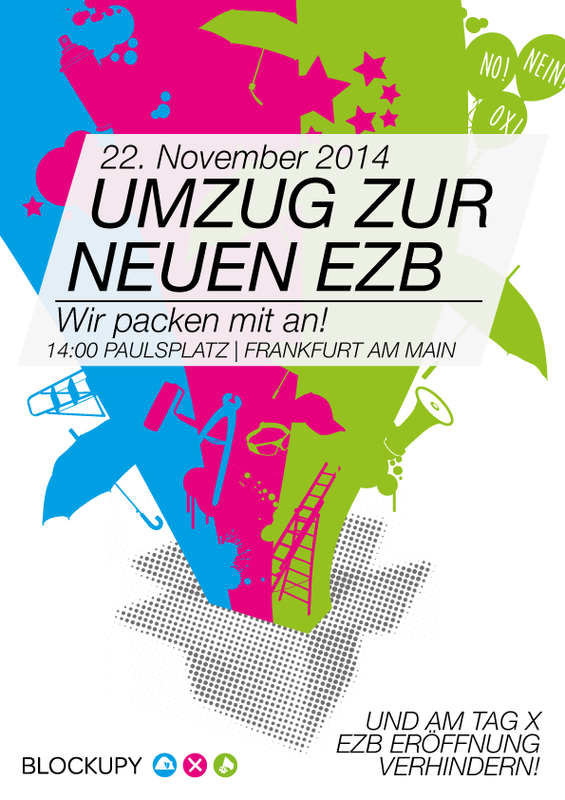 We will be there, at the ECB, together with many activists from European groups, organizations and networks. We think and act with creative forms of civil disobedience, defying all fences. There will be no smooth relocation and no trouble-free crisis policy with us! The march to the new ECB building is, as an announced and registered demonstration, part of the Blockupy festival #talk #dance #act. Blockupy is existing because of active international participation and views itself as part of the international resistance against the European crisis regime. We act in solidarity with all, who share our goal to resist the authoritarian crisis management and Troika policy, to defend the democratic and social rights of employees and all those who are affected by unemployment or increasing precarious working conditions in Europe. We explicitly refuse reactionary or racist positions. The march to the ECB is described in the image of action. in front of the ECB we want to create a situation, which is both transparent and allows participants to support and care for each other in solidarity. We will start and end the march together. We cannot preclude an encounter with the police. Perhaps police forces will try to keep us away from the new building of the ECB. Where necessary, we will float through or around police chains to get to our destination. There will be no escalation deriving from our behalf. Some of us will make use of their right to physical integrity by wearing materials to cover and defend their bodies.